Rendered in pressed copper, the life-size statue depicts a World War One American Doughboy. He stands atop a square tapered marble pedestal which itself rests on a square marble base. Including the base the statue reaches a total height of thirteen and one-half feet tall. The soldier stands upright in the process of taking a step through barbed wire (now missing). In his left hand is held a rifle with a bayonet (bayonet now missing along with the rifles sling) and his right arm is raised holding a grenade. He is dressed in the combat attire of the common soldier of the period, wearing the classic, flat and wide-rimmed helmet. Bronze plaques adore each side of the finished stone pedestal. Right side: THEIR MANHOOD PREVAILED: / THEIR CAUSE TRIUMPHED. The dedication ceremony was originally scheduled for November 11, 1922. However, an invitation was sent to the French envoy Georges Clemenceau to attend and the ceremony postponed pending his reply. The Hornets Nest American Legion Post #9 was tasked with arrangements for the ceremony. This statue was purchased by C.O. Kuester of his own volition on the belief that Charlotte needed a memorial to the men of Charlotte and Mecklenburg County that had served in World War One. He had seen the statue at the 1922 Made-in-Carolinas Exposition held in Charlotte at the booth of the Charlotte Marble and Granite Works. He purchased it with his own funds and after the fact solicited public subscriptions to cover the costs. This statue is one of some 140 World War One Dougboys made by E.M. Viquesney that are still standing, most made from pressed copper. Viquesney mass-produced the statues and corresponding collectible miniatures from the 1920s to the 1940s, with the World War One Doughboy becoming perhaps his most well-known creation and securing his renown as a sculptor of World War One and World War Two soldier figures. See Spirit of the American Doughboy in Nashville and World War II Memorial in Belmont. The form of this statue is called “The Spirit of the American Doughboy,” and was the prize winner in a contest for the best statue depicting the spirit of the American World War One soldier. The contest was participated in by thousands of American sculptors. The sculptor sits on the lawn of City Hall, with trees and shrubbery making a nice backdrop. The statue was first located in the square of a county courthouse that no longer stands. That site became Central High School and is now part of Central Piedmont Community College. It was then moved to Cecil Street (now Kings Drive) near Memorial Stadium and to its current location in the 1960’s. 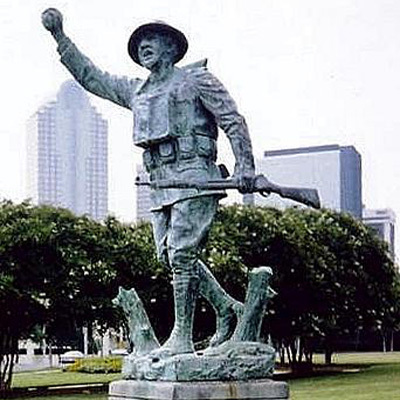 In May, 2014 the Charlotte-Mecklenburg Historic Landmarks Commission approved a plan that would see the statue moved to the American Legion Memorial Stadium as a part of the plan for stadium renovations.